A dog at the City of Palo Alto Animal Services shelter glances out from their cages on Dec. 3, 2014. Photo by Veronica Weber. Dogged by cramped conditions and mounting financial losses, Palo Alto's scrappy but popular animal shelter is once again fighting for its life. Three years after the city flirted with the idea of outsourcing animal services in the midst of a budget crisis, officials are again considering the future of a municipal operation that is now losing close to $900,000 annually. Though city officials are no longer talking about shifting animal services to another city, they are preparing for the possibility of "spinning off" most services to a private organization capable of making the needed investments, leaving only animal-control responsibilities with the city. A new audit by the office of City Auditor Harriet Richardson underscores the steep problems facing the East Bayshore Road facility. Palo Alto Animal Services, the audit found, faces challenges that are "unlikely to be resolved if it continues operating as solely a city-managed function without a significant increase in general fund subsidy, donations, and/or revenue-generating contracts." The City Council's Finance Committee discussed the audit Tuesday night and generally concurred with the assessment of both Richardson and City Manager James Keene that it's time to rethink the entire operation. The shelter's financial calamities began in 2011, when Mountain View pulled out of its partnership with the shelter, taking with it the $400,000 in annual revenues that it had previously contributed. Palo Alto tried to balance the books by reducing staff, but while that effort helped reduce expenditures, it didn't come close to replacing the lost funding. The animal operation currently has 10.66 full-time positions, down from 13.42 two years ago. And while privately run shelters generally rely on donations for much of their revenues, the city's policy prohibits directly solicited donations. The loss of key personnel last year didn't help. When both of the shelter's veterinary technicians left, it had to temporarily close its spay-and-neuter clinic. While the operation has historically generated about $190,000 in spay and neuter fees annually, but in fiscal year 2014 it only brought in $47,500. The city ultimately hired two new veterinary technicians but ended up firing one near the end of the fiscal year. 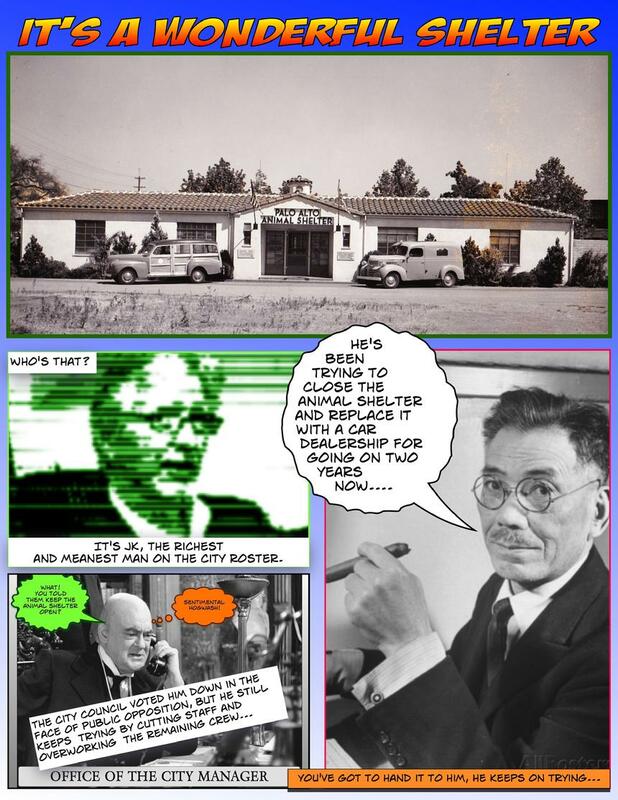 The impending retirement of the shelter's supervisor creates another hurdle. Then there are the facility's conditions. Though the audit cites surveys showing that customers deeply value and appreciate the local shelter, other cities are a different matter. Its cramped and outdated conditions make it difficult for the city to find a new partner that would contribute the revenues that were lost when Mountain View withdrew. The audit notes that existing Palo Alto Animal Shelter facilities "are outdated and inadequate to meet modern animal-care standards, and the City has not successfully completed projects to refurbish and renew the shelter over the years." Senior Performance Auditor Houman Boussina highlighted a list of problems with the current facility: its general lack of space, cramped kennels that in some cases have sharp edges, porous flooring and a lack of a separate receiving-and-intake room. At times, small animals are shelter in staff's lunch room, which presents a health hazard. "It has outlived its useful life and does not meet the modern standard of animal care," Boussina said. The audit offered a series of recommendations with which Keene and the council generally concurred. They include assigning a manager to oversee the animal shelter's transition into the future; conducting a cost-benefit analysis to consider expanded hours for the shelter; engaging nonprofit organizations and other shelters in discussions of operating the shelter; and assessing the feasibility of obtaining funding for a new shelter through fundraising, public-private partnerships, General Fund subsidies or a bond initiative. About the recommendation to separate the animal-control service from the shelter, Keene stated in his response to the audit: "This will be done. At this time, the City Manager presumes that bifurcation of the duties will be our future approach, maintaining (animal control) operations within the city and spinning the shelter off to a nonprofit entity in the longer term. This assumes the shelter will remain in Palo Alto." The Finance Committee will begin considering on May 6 specific budget proposals for keeping the animal shelter afloat and for planning its future. This includes budgeting an additional $200,000 to $300,000 for transition costs, which would include hiring additional staff or a consultant with experience in managing shelters, Keene said Tuesday. Keene pointed to the financial data and noted that the numbers "are going in the wrong direction." The shelter had a net loss of nearly $894,000 in fiscal year 2014, which went up to about $911,000 last year. So far in the current fiscal year, which ends on June 30, the shelter has lost nearly $618,000. The numbers, Keene said, "are a reflection of the fact that the operation, as we have it now, the structure in my view clearly doesn't work." The committee concurred that the animal operation is not sustainable in its current state. Councilman Eric Filseth noted that at least another $2 million will be "flushing down the hole" before any major change is made and asked if the transition period could be shortened. Vice Mayor Greg Schmid, who chairs the committee, also said he was struck by the severity of the shelter's losses. "The financial figures are quite dramatic," Schmid said. "It is striking to see that we've been losing a substantial amount of money for a number of years." The audit won praise from the committee and members of the public who attended Tuesday's meeting. But local resident Barry Hayes took issue with any suggestion that the city can't operate an improved shelter. He encouraged council members not to view the service strictly in economic terms. "I don't expect you to say fixing potholes is 'flushing money down the hole.' I don't think it should be expected to be the profit center," Hayes said. Keene agreed that it's not just about the money, but noted the city would not find these types of losses acceptable in other municipal operations, whether utilities or senior services. "I don't like us being in this situation. I don't like us losing this kind of money," Keene said. "I don't mean to say it's just about money. Hearing from folks and the different perspectives, it's very clear that the facility and the operational standards we expect in our city are not being met in our current operation. We would not apply this approach in other service areas and we need to fix it." The most likely prospect at the moment is a partnership with Palo Alto Humane Society, which has already made two different offers to the city. In the first offer, it proposed to raise money for an expanded facility. The nonprofit subsequently revised its offer and is now proposing to focus on expanding the shelter's services and educational programs. Carole Hyde, executive director of the Humane Society, presented to the committee her vision of the local shelter as a modern facility that functions like a "community center" with vibrant programs, enhanced outreach, social activities, foster programs and school field trips. "A shelter for Palo Alto must be a community center to thrive -- a community center to involve the people of Palo Alto, bring them to the shelter and encourage them to embrace the shelter as their own," Hyde said. Keene noted that a shift to a different model of operations could improve, rather than displace, the local operation. "More than anything, folks and staff see this as not just plugging up a hole or resolving a deficit, but really improving and enhancing the service here in the city, and it's an opportunity," Keene said. After being on the job for a year, it's nice to finally see an audit from the new City Auditor. Resident Barry Hayes is right - the animal shelter shouldn't be looked at as a profit center, or even as a break-even proposition. The Human Society of Silicon Valley has a beautiful facility in Milpitas and has animals for adoption at local pet stores. There really isn't any reason for Palo Alto to run a competing service. Get rid of it as a city function! 10+ city employees (and their pensions and benefits), unsupportable by the shelter unit's proceeds. Now comes a call for consultants; more staff; more spending on purportedly "outdated" facilities; and a foreshadowing that new/replacement staff pay and pension and benefits need to be substantially increased. I don't think there is any such thing as competition in the animal shelter "business". Overcrowding is the biggest issue, and the more shelters the better in order to save animals and find new homes for them. The harsh reality is that if this shelter closes then more animals will be euthanized, and less will have spay/neutering done which will cause more overcrowding. I hope this shelter finds a way to survive. Shame on Mountain View for backing out. Who the heck is managing the finances??? There is not enough money for a needed animal shelter, but we have plenty of funds for a new fountain (during a drought) on California Avenue, and $6.9 million dollars for street scaping. Unbelievable!!!! Clearly, the inmates are running the asylum. Before getting excited with Ms. Carol Hyde's vision, I want to see the following pertaining to her organization, Palo Alto Humane Society. * Accountability and auditing provisions. * Provisory for the amendment of the statutes or articles of incorporation. * Provisions for the dissolution of the entity. * Tax statuses of corporate and private donors. * Tax status of the founders. Who are the Board of Directors and members there? How many employees does this organization have? What have this organization done? Our pets are way more important to us than a $4,500.000 redesign of the first floor of City Hall, than $400,000 in interactive "wayfinding" art for the same first floor and than $7,000,000 for the long "redesign" of Cal Ave. Were those projects "self-sustaining" or profit-centers? Save the shelter! We're spending more on "community outreach" consultants and pr people than the Shelter is losing. Let them raise some money for the Shelter for a change. I've NEVER gotten a solicitation from the Shelter and I'm a dog owner and have been for 20 years. I can't help wondering what health hazards are presented by eating lunch in the same room as a hamster or a parakeet? Also, while the facility is showing its age, it's overstating the case to say that it has "outlived its usefulness". Stray animals come in, they are nurtured and nursed back to health by employees and volunteers, and finally they are rehomed. That's useful. Hey, Palo Alto: not everything that is old needs to be torn down. Sally-Ann Rudd is a registered user. Peninsula Humane Society have a gorgeous facility in Burlingame, paid for by donations. If they could duplicate in Palo Alto, all would be good. Let our highly paid "community outreach" consultants and pr employees do something useful for a change and raise money for the Animal Shelter. Every month I get an erroneous mailing or 5 from the Utilities Dept. but never have I seen a mailing for the Animal Shelter. Question: Why does the city's policy prohibit directly solicited donations for the shelter? Please explain how this is a conflict. It appears there are enough people in Palo Alto who feel strongly about preserving these services, so perhaps some percentage of these people would willingly donate money to its support. Maybe a request to be tacked onto the already issued utility bills. This is clearly a question of priorities, and Palo Alto's priorities are clearly screwed up! If a lost or injured pet is picked up by Animal Conteol ( assuming there will still be an Animal Control Dept), where are they supposed to go? All the way to Milpitas, or Burlingame? In Bay Area traffic??? Get real, the poor critter may not survive the long drive. What about abused animals? And what if Animal Control no longer exists, as I have heard will happen if there is no shelter? Who will rescue animals in need: the strays, the abused, the injured or sick? In a perfect world, everyone would be compassionate toward their pets and we would not need any of this. But let's face it, this is far from a perfect world. As perfect as we like to think we are in Palo Alto, we still NEED a shelter and an Animal Control Dept. Seems to me the answer might be found in relaxing the policy that "prohibits directly solicited donations." Yes, finally an audit from this city auditor. I attended the meeting last night and wondered why a senior staff auditor gave the summary of the report. Based on other meetings I've attended, shouldn't the city auditor do this? I would have liked to hear from her. Palo Alto does not need an animal shelter at all, it just that, as in many cases in Palo Alto, a very noisy very small % can prevent change. There are other options available, such as other local shelters. This is just a horrible waste of our money and will only cost us more and more as time goes by. A small minority? About 50% of Palo Alto residents have pets. Almost every day Next Door has a notice about a lost or found pet. Pets are family members. Why use the word losses instead of cost? The city manager does not refer to "losses" when he talks about administrative salaries for the city manager and his many minions. What about the losses from the planning department spending hundreds of thousands of dollars trying to change the zoning to favor an Arillaga development around the train station? What about the losses incurred from the study of California Avenue to enable higher density without any corresponding increase in infrastructure? Or the losses from transportation studies that only took into consideration current developments and were forbidden to include any approved but not yet built developments? Let's call for transparency. Let's see a budget by cost centers. Most accounting systems aggregate costs into cost centers (previously called departments). Tell us truly where the costs are and what revenue is associated with the cost centers, if any? Unfortunately, this would reveal where the true costs really are - for the bloated bureaucracy. The costs of any actual services to the residents of Palo Alto are supposed to be recovered through fees. If I remember correctly, when this was last discussed three years ago, one big advantage of the Palo Alto shelter is that they accepted all animals surrendered by residents of Palo Alto, implying that other shelters do not. A daughter of a friend in another city, with a new baby who turned out to be allergic to cats, had a very difficult time finding a shelter to take her cats. The residents of Palo Alto made it clear three years ago that they want a local facility for its animals with policies decided locally. If the city had been willing to reduce charges to Mountain View, they never would have lost the account. Unfortunately, the current city administration is far more interested in satisfying developers than its residents. Millions for city hall and poorly designed streetscapes, but nothing for the Baylands Interpretive Center or the Animal Shelter. We need to change priorities now. If there is a problem with city accepting donations for a city service, they should look for ways to spin Animal Services off into a non-profit that is supported by donations from local animal lovers. The audit report is worth reading. Any decision on how to move forward should take animal welfare into account. PAAS performs poorly in this regard. The PAAS Maddie's Fund statistics are stark and deadly compared to other cities such as Austin and Reno. Hundreds of other much less wealthy municipal and county animal shelters save (percentage-wise) significantly more animals' lives, including SVACA. The report makes it clear that the issue is not just money, but also performance and accountability. For many years now, City Manager Keene has desired to re-purpose the property where Animal Services is located for use by the local Auto Dealers. Residents should be wary and do much greater due diligence in this matter before reaching any conclusions. Another boutique project in Palo Alto. Yet we do not have enough money for a new police dept. building. I get it that Palo Alto citizens want a special atmosphere, with special services, but we seem to be forgetting that we have unfunded mandates for retirement obligations. Palo Altans have long had a very hard time saying "no" to anything that makes them shed a tear. A combination of oversensitivity and liberal guilt. What is the true cost of this animal shelter thing? Is it worth it? Craig, please don't preach about how we don't have enough money when there is such a ridiculous amount of waste and over-spending by the City when they already have hugely lucrative pensions. An assistant City Manager making $220,000 AND getting a $30,000 housing allowance when she's moving here from Napa which has equally high housing costs?? Just to cite ONE example. A night police dispatcher making $300,000 once she gets over-time pay? Giving an incompetent former city manager over-sight on a new $3,000,000 project after he's screwed up the Cal Ave "redesign" which ballooned in cost to $7,500,000? Along with others, I wonder why an animal services department is a department charged with being a profit center or at least revenue neutral. In my mind, a city the size of Palo Alto should have an animal services department as part of its city's responsibility. There is no reason why it must be an architectural statement with all the latest and greatest devices for veterinary medicine. However, Palo Alto should provide a decent (healthy and clean) space for animals impounded and animals ready for adoption, and it also should provide a low cost spay/neuter and immunization clinic. To foist that off on an non-profit organization is to shirk civic responsibility. I could add other items like a sustainability officer and city arborists and anaerobic digestion fiascos and absurd public art projects and subsidized housing and historical homes designations, but that would just be piling on. I think each of those boutique projects should be cost projected out over the next 40 years. Same with the animal shelter. It's called transparency. I say we don't really have the money for all the boutique projects, including the animal shelter...and I'm willing to preach about it. I thought there was a non profit raising funds for the shelter??? Friends of the palo alto animal shelter FOPAS. Who is over seeing that group if funds aren't available? Where is the money they were supposed to be raising? Let me get this straight. Palo Alto's incompetent City Manager Keene can find $4.5M+ for an ugly interactive foyer in city hall. He can also find the money to put glitter and glass shards on the California Avenue pavement. He can also find $8M for Buena Vista Trailer Park. But he can't find the money for our valued and beloved PA pets. Trust me, most Palo Altans would prefer a pet shelter over an interactive city hall foyer. 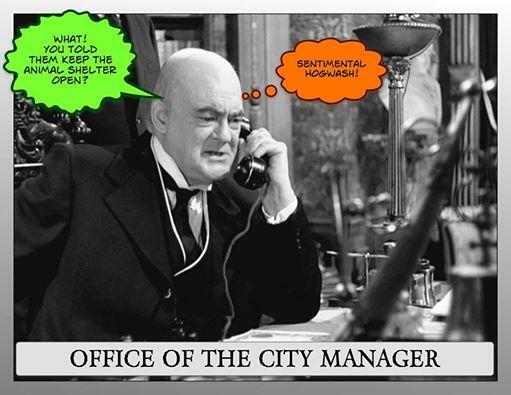 Why doesn't the city council have the integrity and sensibility to fire Jim Keene. Keene's list of incompetence goes on and on. Someone needs to do an in depth investigation of Keene and his business dealings. Palo Alto, one of the wealthiest cities in the country, struggling to keep a decent animal shelter??? Unbelievable! Once again, the idea of demolishing and NOT replacing the city animal shelter raises its big ugly head, while once again residents are subjected to a growing list of overinflated expenditures to "beautify" the city, make City Hall at super-inflated cost a "fun and interactive" place to visit, and open the floodgates for huge development firms to leave their ugly mark and take the money and run or come back to line their pockets with more. Once again the City of Palo Alto appears to the rest of the world to have no care nor compassion for animals, and does that even matter to this City Council? When is this going to end? Does super-wealthy Palo Alto, which backs all of the above-mentioned city-funded shenanigans and more, really dismiss animals and humane behavior as merely an activity of the 98% who might, in fact, care about issues other than big bucks? I thought that when we voted last November, we voted for a City Council that stood for resident stakeholders and resident concerns. I'm a hopeless idealist, I guess, imbued with the (most likely idiotic) hope that most people in this city care about their animals and the homeless abandoned animals and want to have a shelter worthy of the status that Palo Alto seems to have achieved in the eyes of the rest of the world. The animals in this city ARE the responsibility of Palo Altans and their government and their care needs to remain as the purview of the City of Palo Alto. What is this City Council going to do about this? @marie "Why use the word losses instead of cost?" Exactly right. Couldn't agree more with the comments above about how our city manager, Mr. Keene's priorities and how he manages the city finances. Including the way the budget is presented to advance his agenda and avoid public scrutiny while doing so. Write to the City Council and tell them how much we value the Animal Shelter! You might also invite them over here to read the comments in this topic and on the Cal Ave "redesign". I adopted my first, most beloved cat, from Palo Alto. Now I live closer to RWC and, when taking ferals to be fixed, would prefer to go to the closer Palo Alto shelter than to go all the way up to PHS, especially as drop off and pick up are during rush hour. I think it's important to have a shelter in this 'middle' area, as "Priorities" points out. Let's figure out how to support them with donations. "I say we don't really have the money for all the boutique projects, including the animal shelter...and I'm willing to preach about it." Thank you for preaching, Craig. I completely agree. Palo Alto likes to live in a fantasy zone with regards to fiscal responsibility. I admire your willingness to confront those who refuse to realize it. The Palo Alto Humane Society (.org) website will address many of your concerns. Zero priority: Absurd projects like anaerobic digestion industrial plants, public art, historical home designations (and several others). Question: For those who are feverishly supporting the animal shelter, what are your priorities? Weak on facts but gets the word out that serious problems exist at PAAS. Some here state that animal shelters are not "essential." I beg to differ. It is the responsibility of a civilized society to care for those citizens, two-legged or otherwise, who have no voice, who cannot help themselves. It is about helping animals find homes, or reuniting them with their owners. For the creatures, it is a matter of life and death. Are there no angels to come forward? Years ago another city had a shelter problem and two great women (Kroc and Copley) met, figured it out, and most generously. Too bad our city has so few millionaires/billionaires willing to help living creatures. Too bad city government finds fountains and foyers and public art more important than homeless cats and dogs. It is shameful that a city of Palo Alto's wealth cannot deal with this vital issue. The auditor's report makes it clear that while money is an issue, it is not the only issue. There has been no oversight of the shelter, which is currently under the management of the police department. The shelter has always focused on animal control, and never on animal welfare. Homeless animals suffer (and die) needlessly at PAAS. Assuming the auditor's recommendation is followed - most importantly that of bringing in a NEW manager immediately and moving the shelter out from under the police department - there is the possibility that many of the problems will be fully identified, understood, and finally resolved. Leadership comes from the top. No problem funding three different sets of various electronic flashing light systems at a crosswalk at Hopkins and Newell Rd- two extra sets recently added. It's quite unusual- I have never seen anything like this- take a look at it. Yes, Palo Alto values and needs an animal shelter, but if anyone thinks the City can competently run a shelter as part of City government, they are hallucinating. The consultant's report may be a starting point, but it did not look at the shelter actual performance, which is abysmal by any objective or comparative measures. The City and the shelter management like to blame the physical shelter, but the real problem is management and staff. Before spending money on a new facility the City should do a clean sweep and see what INDEPENDENT and committed animal care management and staff could do to radically improve the shelter's performance. Why was the shelter's spay/ neuter clinic (which was supposed to provide off-setting revenue) closed for nearly a year?? Was it really true that the clinic was closed because they couldn't hire a vet tech??? And that took nearly a year?? Does anyone believe this? And if it is true, what does it say about the shelter and city management? Or was someone dragging their feet to actually torpedo the turn-around? So....(1) The City needs a local shelter. (2) Palo Alto City government cannot run an animal shelter (3) There are plenty of better run animal shelter organizations, and models for running those organizations. (4) Subsidizing one of those proven and successful organizations to run the shelter would be far cheaper and more effective than allowing this failed model to continue to fail. (5) Don't waste money on educational programs until you have a track record for actually helping and rehoming animals. When people worry about the shelter closing, they are not worried about losing educational outreach programs, they are worried about more homeless animals on the streets. First things first. The education programs go on now, and have nothing to do with the actual shelter. They have been proposed as a way to involve the Palo Alto community in animal services. The spay/neuter clinic was actually closed for OVER a year. The city claims it took that long to hire 2 vet techs. The audit showed that the shelter had a dismal performance record, but that community support for animal services is strong. The city manager says they will probably hire another consultant (*eyeroll*) to proceed. The Palo Alto Animal Services is one of the few positive programs in Palo Alto. I guess they just don't give the City Council members the political advantages as building more apartments, condos, businesses and hotels do. The Shelter is full of people coming to use the low cost services that probably could not get services at all if it were moved to another location. I know there was a proposal to put a car dealership there, but we already have too many car dealershp. If the city manager can promise to waste 8 million dollars to keep a firetrap trailer park open, Palo Alto clearly has the money to keep the Animal Services open. One need only look to Peninsula Humane Society in San Mateo to get some idea of what could work. 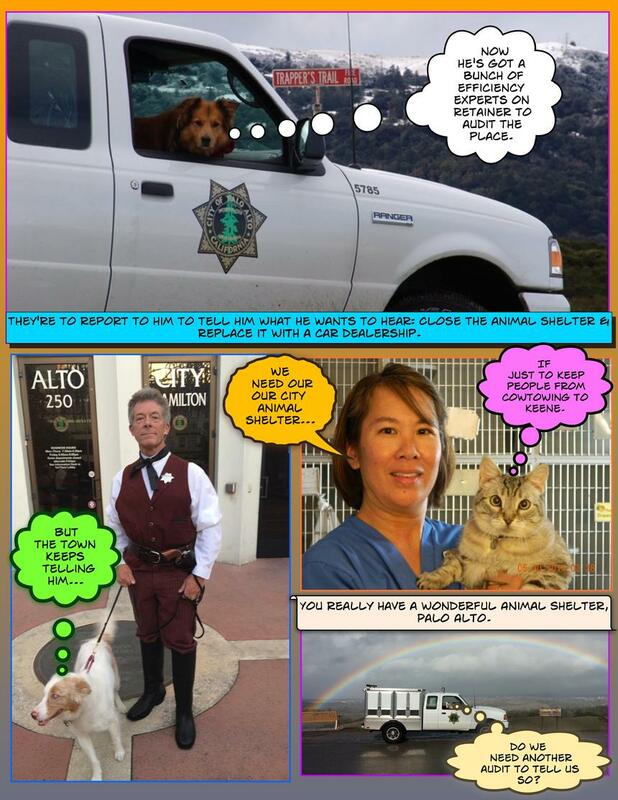 As for Palo Alto Humane Society they have NO experience with shelters what-so-ever. "This includes budgeting an additional $200,000 to $300,000 for transition costs, which would include hiring additional staff or a consultant with experience in managing shelters, Keene said Tuesday." OK, this is just great. The City, which could not hire a vet tech (or two) in MORE THAN A YEAR now wants to hire "additional staff"!!!! So we can expect to get this new experienced professional "staff" on board sometime in.... 2025? And given the dismal performance of the shelter to date on so many fronts it is hard to make an argument that the City would even know what constitutes good shelter staff and managers. If they do, how is it that things are so badly run right now? And have not gotten any better since the last "turnaround" plan? Don't dig this hole any deeper. Bring in an ORGANIZATION that can successfully run THE WHOLE shelter / adoption / outreach operation and subsidize keeping the physical shelter in Palo Alto. Humane Society Silicon Valley has excellent community outreach and education and they have shown that they can raise money from donations...and achieve high adoption numbers. Then you don't need to pay consultants or new staff who don't have actual responsibility and authority while the shelter continues on its merry path to failure for the animals and fat pensions for the employees. Oh, perhaps that is the reason for delay, delay, delay ? This sounds like some excuse to use that space for storing cars from the Embarcadero Auto dealers. Charge them for the space where they are storing cars and use that to offset the cost of the shelter. That this city would not have a top class animal shelter is disgusting. If we could incorporate some set-up that puts the police dogs in that area then we could use alternate forms of funding to support the site. Its amazing to see how people just criticize others who are trying to do their job. Here is a simple problem, our Animal shelter is woefully out of date. I say by about 50 years. I'd suggest all the people who are criticizing city managers should go look at the place, its awful. Honestly would you board your cat or dog here. It needs torn down and rebuilt but that takes lots of money. I am speaking on behalf of several formal PAHS community volunteers and YES, 4 yrs ago, Carole Hyde gave us a box of wet can cat food and gave us the so called community volunteer badges and some 30 people showed up and listened to her on that day. But I noticed more and more dedicated volunteers were leaving. According to PAHS, To alleviate the suffering of animals, increase public sensitivity to animal issues and elevate the statue of animals in our society through innovative programs in intervention, education and advocacy ----> these are their mission. I just read PAHS's most recent 990, and PAHS has 0 volunteers. and Palo Alto Animal Service does the Education outreach and last year alone, PAAS reached over 4000 children in our communities and children & teachers love having the animal control officials over at their schools. Carole Hyde isn't doing her job as director for PAHS and what PAHS should stand for. I do not understand why some people here are even comparing HSSV to PAAS. HSSV has over 1,000 animal shelter volunteers (including the satellite adoption centers). HSSV has approximately 100 employees and 700 active volunteers who would come in and volunteer at its facility --- 48,000 square foot building on 4.8 acres of land and NO ACOs. You all know where PAAS is located and we know that the shelter building is old & fragile. You can't compare the new & Modern HSSV to our PAAS without making some improvement and investment. But if anyone who could read the PAAS audit results, it is astonishing to find out some over 90 % of Palo Alto, Los Altos and Los Altos Hill residents are content with PAAS's various services. You want to compare HSSV to PAAS? Then make your city manager Keene to make it happen! How appropriate that the PA Weekly is including links for depression therapy in this article. I think I am ready to make an appointment. The man who has never set a foot in our animal shelter will soon decide our fate. You never visit us at all. The thought of us you cannot bear. Though you’ve got us in the sink. You think that you can wear us out. The good, perhaps great, performance of animal control has covered up the abysmal performance of animal welfare at PAAS, and the complete lack of accountability. Surely you have noticed how many animals are needlessly dying (being killed by PAAS management). PAAS has a live release rate of 78% versus progressive cities, e.g. Austin, that have >90% live release rate. This is unacceptable killing in the second wealthiest small town in America. Please be part of the solution instead of blocking changes. Animal lives matter. Why not do it all? -they can have space on utility bills for an "ask"
The city can commit a certain future $$ budget guaranteed. - the city can coordinate outreach joint events with Junior Museum on Dads and Donuts days. Other events. -the city can lease the land to car dealers on agreement that the lease money go to the shelter ( maybe half of city tax revenue also) maybe donors and Dealership build new facility elsewhere. There you go: new management, new business model, city commitment of support, new revenue streams, new outreach programs. Any organization can have volunteers including animal shelters run by government entities. PAAS has a handful of volunteers and is negative toward adding volunteers or fosterers. Volunteers bring tremendous value, but they also ask questions and shed sunlight on the operations.